Severus had two sons, Caracalla and Geta. Their mother was his second wife, Julia Domna. She was a great beauty and also a friend and patron of artists and writers. She wasn’t the kind of woman I would have picked out for the soul mate of a dour professional soldier. And maybe she wasn’t. Severus had chosen her on the basis of some favourable astrological omens. It may have been a marriage of convenience. It must have been really painful to a hard working self made man that his sons grew up into a couple of spoiled brats who spent all their energy either enjoying themselves or indulging in one of history’s classic cases of sibling rivalry. The two brothers hated each other with a passion. Severus tried to calm this down by treating them with strict equality. Anyone with kids will sympathise with his plight on this one. You may be emperor of the world but even so, how do you cope with your offspring bickering? Families eh, who’d have ’em? But of course Severus wasn’t just another guy, and the strife in his household had ramifications. Both sons gathered factions. It is easy enough to see how people might stir things up in the hope of some gain at a later date. Severus unwittingly made things worse. He made both his sons co-emperor, which inflamed the factionalism still further. Imagine the delight with which Severus must have received the news that the frontier of Britain was under attack from the unruly natives of Caledonia, modern day Scotland. It gave him a chance to get his sons out into the field and give them a bit of an idea about how the world worked. Marching, camping, facing danger. That should sort them out. The people living beyond Hadrian’s wall were not at that stage civilised and didn’t leave any written records. So we don’t know what their reaction was to the news that not one, but three emperors were on their way sort them out. This was probably a bigger reaction than they were expecting. They should have been worried. Lets see what the two sides in this conflict had going for them. The Romans had highly trained and veteran legions led by one of the most able of generals with many years of experience and success behind him. The Caledonians top card was rather scary warpaint. The Romans were able to push right up into Caledonia. With no effective means of resistance available to them, the tribesmen sued for peace and surrended their arms. The legions left. As soon as they were gone the Caledonians broke out into open revolt again. This wasn’t the shrewdest move given that Severus was still in Britain and given his track record of treatment of people who got on the wrong side of him. He decided to wipe the tribes out once and for all. Severus did not make idle threats. Things looked grim. But the planned massacre never took place. Severus died suddenly in York. This last campaign of Severus was only a success in the most limited respects. Britain was defended from attack, but it was never really in that much danger in the first place. The local legions could have handled it. The terrain in Caledonia hadn’t really suited the legions and they suffered heavy unnecessary losses. But the career of Severus makes his reputation as a soldier secure, and military glory wasn’t really what he was after this time. He was 65 and suffering so badly from gout that he had to be carried around in a litter. He had reigned for 18 years. Gibbon thought that by the end he was longing for death. This trip to Britain had been intended purely to instil some sense into his offspring to make them ready to continue his legacy. There wasn’t much sign that it had had any effect. Their first action on jointly gaining the throne was to rush back to Rome to continue their feud, undoing what little had been achieved in the province. But before we follow them a brief digression. I know that this is a long book, and that we are only on Chapter 6 and that I skipped Chapters 1 and 2 because they were too difficult, but Gibbon makes an allusion to something too interesting to disregard. A few years before Gibbon published his book the cultural world of Europe had been captivated by some publications made in Scotland by a man called James MacPherson. He claimed that these were traditional epic poems that he had recorded and translated from the Gaelic – the language that the Caledonian tribes spoke. They were supposed to have been composed by an ancient bard called Ossian. The main action in the poems was the fight between tribal chiefs Finbar and Fingal and the Romans led by Severus. Although hardly heard of nowadays, at the time Ossian was a sensation. He was translated into all the main European languages. Goethe was a fan. So was Napoleon. Ossian inspired some of Schubert’s songs. The most remarkable example of their influence is the name Fingal’s cave attributed to a rock formation in the Hebrides Islands. Mendelssohn wrote a piece of music inspired by it. But the name is not ancient. It got its name in the Victorian era in a reference to the Ossian poems. There is something very appealing about the idea of an oral tradition preserving historical events for centuries. And what patriotic Briton wouldn’t want to have a native grown Homer? Europeans of Gibbons time were as far removed from their tribal roots as we are today, and like us lived lives that were ordered and not particularly heroic. Being able to read romantic stories from a time before civilisation just hit the spot. The authenticity of the poems of Ossian was controversial from as soon as they were published. Dr Johnson was particularly rude about them. He refused to take them seriously because they were badly written and because MacPherson despite much needling, could not produce the manuscript from which he had translated them. Gibbon is a wiley fox, rarely caught out by history. He keeps the question of whether or not the poems are genuine open. He sounds suspicious of them. But he can appreciate the appeal. He can contrasts the heartless behaviour of the Roman with the nobility of the Finbar of the poems regardless of whether or not he is factual. With the benefit of hindsight we now know them to be frauds. 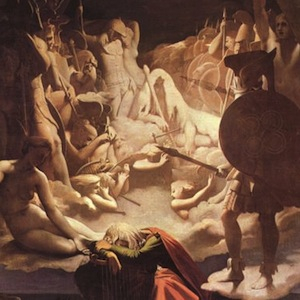 While MacPherson might have had some contact with some gaelic folk tales and songs, he basically made up most of the work he attributed to Ossian who certainly never existed. Ossian has still got a few fans who claim it to be a great work of literature despite its being a hoax. But I have to say that Ossian isn’t on the list of works for review by the History Books Review blog. I had a go but I found it unreadable. Some things are just of their time and don’t survive I suppose. But back to reality. It was obvious that the rivalry between the brothers would lead to trouble sooner or later. Probably sooner. Definitely sooner. In fact things started straight away with an unsuccessful attempt by Caracalla to get the legions to declare himself the sole emperor. Geta was popular with the troops, and they refused to disobey the clear instructions of Severus that the throne should be shared. The brothers obviously had some work to do on their relationship. They needed to get back to Rome. The Gaels were left in peace. They didn’t produce a northern Homer but they did survive and unlike Latin, their language is still spoken today.